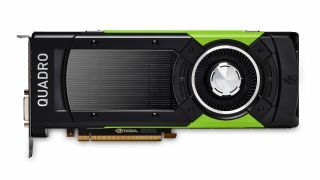 Over at Solidworks in Los Angeles, Nvidia has revealed a crop of new Pascal-based Quadro graphics cards led by the GP100, which the company claims will effectively grant supercomputing capabilities to a desktop workstation PC. The Quadro GP100 is certainly a very tasty piece of hardware aimed at the likes of deep learning, engineering and simulation workloads, as well as VR content creation. Based on the SPECviewperf 12 benchmark, it boasts no less than (up to) double the performance of the firm’s previous-generation solution. It also comes with 16GB of HBM2 (high-bandwidth) memory and NVLink allows for a pair of the GPUs to be combined for 32GB of HBM2 on tap in a single PC. To throw some more juicy numbers at you, the GP100 offers ‘unprecedented’ double precision performance, Nvidia notes, tipping up over 5TFlops which is nearly triple the speed of the Quadro K6000. Nvidia says that single precision (FP32) performance is 10 TFlops, doubled to 20 TFlops when in half precision (FP16) mode. The Quadro GP100 is joined by five other offerings, namely the P4000, P2000, P1000, P600 and P400, which boast different levels of power depending on what you need (although only the flagship GP100 has HBM2 video memory on board). The company also said that its new Pascal-based Quadro cards are capable of rendering photorealistic images over 18 times faster than an Intel Xeon E5 2697 V3 (2.6GHz) processor with 14 cores (that’s 720p footage with Iray). The launch of this host of cards follows the release of the Quadro P6000 and P5000 last summer. These powerful new GPUs will be available from as soon as next month, although the exact pricing is still to be confirmed. Obviously enough, the beefy GP100 is likely to carry a very weighty price tag.